ROGERS, Ark. 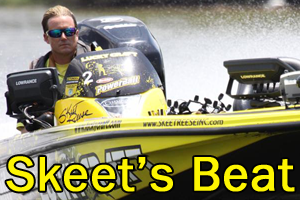 (April 12, 2013) – Pro Brandon Coulter of Knoxville, Tenn., caught a five-bass limit weighing 14 pounds, 12 ounces Friday to grab the lead on day two of the Walmart FLW Tour at Beaver Lake presented by Kellogg’s. Coulter now has a two-day catch of 10 bass weighing 31-15 and holds a 1-pound, 12-ounce lead over Austin Terry of San Angelo, Texas, in a tournament featuring the world’s best bass-fishing pros competing for a top cash award of up to $125,000. 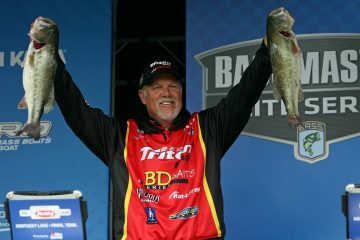 “Yesterday I caught my limit in 15 minutes,” said Coulter, who has more than $240,000 in career earnings with FLW. “Today I went back to the same area thinking I would catch a limit of spotted bass for 7 or 8 pounds and just get myself going. There was nothing there. I didn’t catch a fish. Coulter weighed in four largemouth and one spotted bass in his five-bass limit, and estimated that he caught around a dozen keepers throughout the day. All of his fish that he caught came on an umbrella rig. When asked if he was confident that his pattern would hold up for Saturday, Coulter was hesitant to give any predictions. Christie won Friday’s 3M ScotchBlue Big Bass Award on the pro side with a fish weighing 6 pounds, 8 ounces to win the $500 prize. Overall there were 596 bass weighing 1,292 pounds, 11 ounces caught by pros Friday. The catch included 79 five-bass limits. 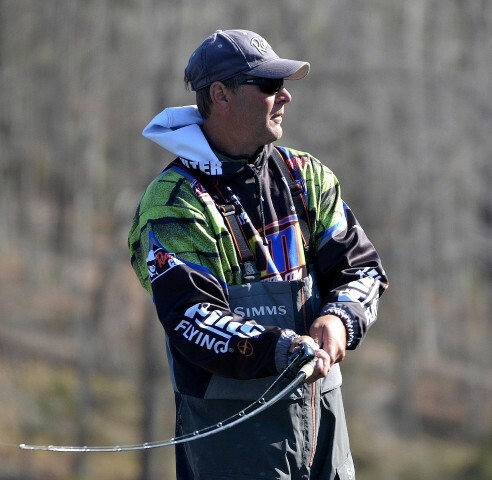 Pros are competing for a top award of up to $125,000 this week plus valuable points in the hope of qualifying for the 2013 Forrest Wood Cup presented by Walmart, the world championship of bass fishing. The top 35 anglers in the point standings from the six events on the 2013 Walmart FLW Tour will qualify. The 2013 Forrest Wood Cup will be in Shreveport, La., Aug. 15-18 on the Red River. Jason Johnson of Gainesville, Ga., leads the co-angler division with 10 bass weighing 27 pounds, 1 ounce followed by Steven Meador of Bella Vista, Ark., in second place with 10 bass weighing 24-1. Jack Minnig of Levittown, Pa., caught Friday’s 3M Peltor Big Bass weighing 6 pounds, 6 ounces in the co-angler division to win $250. Overall there were 299 bass weighing 574 pounds, 10 ounces caught by co-anglers Friday. The catch included 21 five-bass limits. Anglers will take off from Prairie Creek Park located at 9300 N. Park Road in Rogers at 7 a.m. Saturday and Sunday. Saturday and Sunday’s final weigh-ins will be held at the John Q. Hammons Center located at 3303 Pinnacle Hills Parkway in Rogers beginning at 4 p.m.
Coverage of the Beaver Lake tournament will be broadcast in high-definition (HD) on NBC Sports Network when “FLW” airs May 19 from 11 a.m.-12 p.m. ET. The Emmy-nominated “FLW” television show is hosted by Jason Harper and is broadcast to more than 564 million households worldwide, making it the most widely distributed weekly outdoors-sports television show in the world.